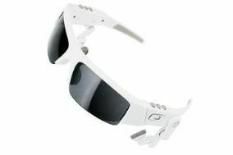 Oakley O Rokr review | What Hi-Fi? Bluetooth headphones with a pair of sunglasses - sound like bog-standard ear-buds. Combine Bluetooth headphones with a pair of sunglasses, and you get a jaw-dropping price. They sound about as good as a pair of bog-standard freebie ear-buds – rather like the £35 Bluetrek – but cost a whole lot more.